What's the difference between an asteroid and a meteorite? On June 30th, 1908, the boreal forests of Tunguska, Siberia, were shaken (and subsequently flattened) by a massive explosion. It wasn’t man-made — an asteroid pierced our planet’s atmosphere and exploded before hitting the surface. 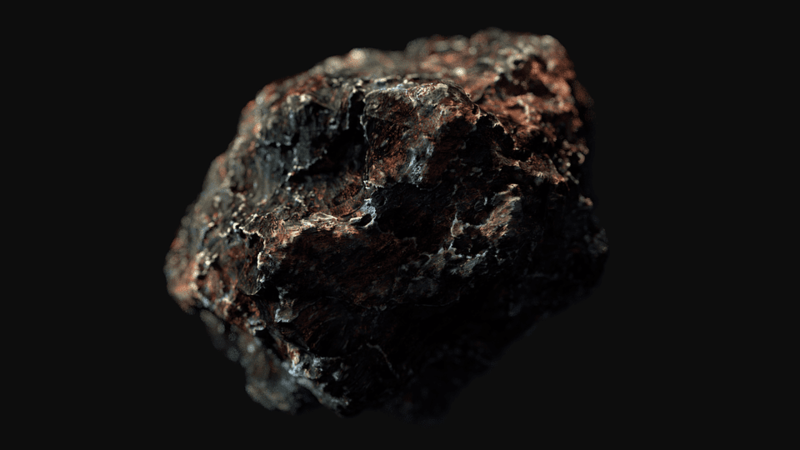 Artistic rendering of a meteorite. This explosion, known as the Tunguska event, would make history. It was the largest impact event humanity has ever witnessed first-hand and would lead the UN to declare June 30th the International Asteroid Day. While definitely awe-inspiring, the event didn’t lead to the massive loss of life that, say, the Chixulub Impactor caused (that’s the pebble that killed the dinosaurs). 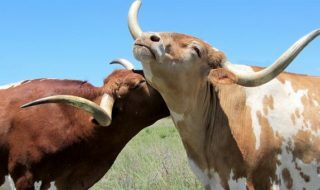 So why did one space-rock kill off the largest beasts to ever roam the Earth, while another merely flattened 2,000 square kilometres (770 square miles) of forest without causing a single human death? Well, the secret is all in the definition. Today, we’ll take a look at that simple yet oh so important distinction between an asteroid and a meteorite. The word itself gives us a glimpse into the nature of asteroids. “Aster” is the ancient Greek word for ‘star’, and the suffix “-oid” is used to show an incomplete or imperfect resemblance to the root word. “Asteroid”, therefore, means ‘star-like’ or, taken more literally, ‘star-like, but not quite’. Keep in mind that for the ancient Greeks looking up into the night sky, planets and stars all looked the same; ‘aster’, therefore, can be understood as both ‘star’ and ‘planet’. 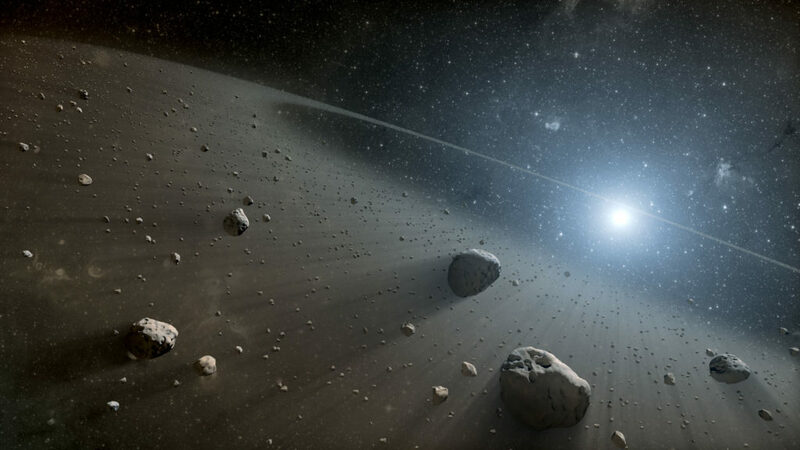 Artist’s concept of an asteroid belt around the star Vega. Oumuamua, the first object to pass through our solar system that was confirmed to come from outside it — originates from this system. Asteroids are chunks of space rock ranging from one meter to almost a thousand kilometers in diameter. The larger ones may rightfully be considered minor planets (or dwarf planets/planetoids). 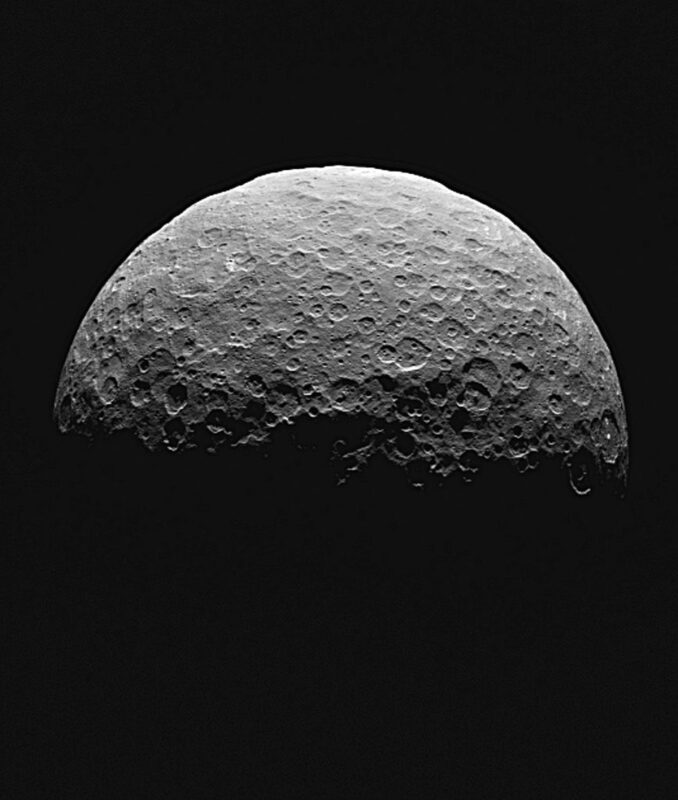 Ceres is a good example of this latter category, and the largest known asteroid. These large ones closely resemble planets: they’re roughly spherical and have at least partly-differentiated core structures. They’re generally considered baby planets that didn’t quite make it to adult status. Most asteroids, however, are quite petite. They also don’t seem to prefer a particular shape. 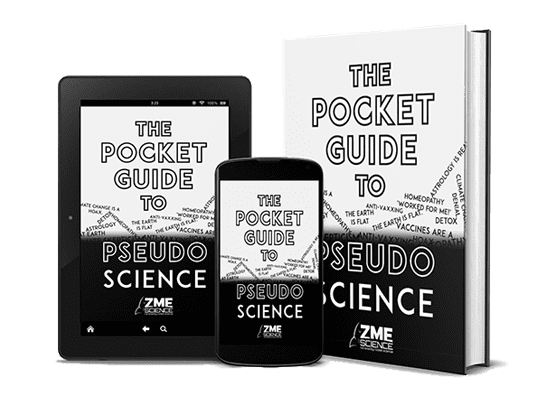 To the extent of our knowledge, they either formed from the primordial matter of a stellar system or via subsequent impacts between its first rocky bodies. Most asteroids in our neighborhood today make a home in the asteroid belt (surprising, I know). 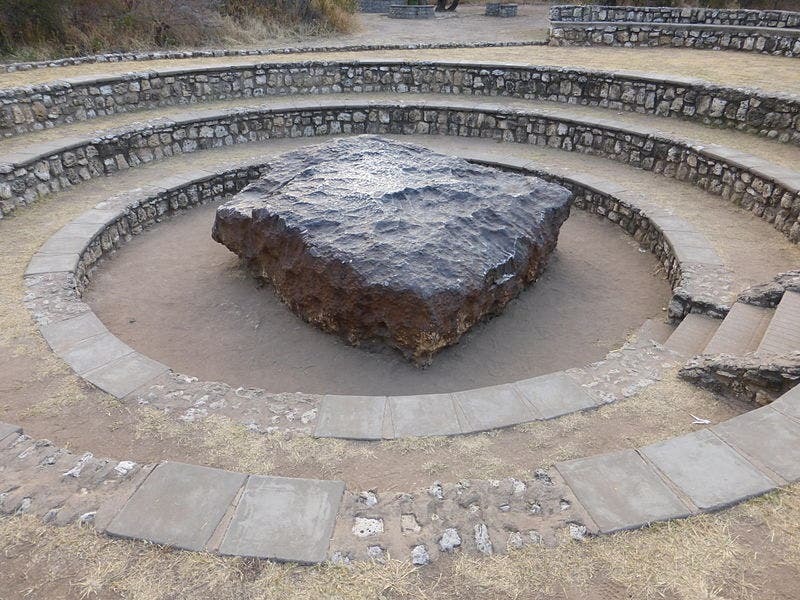 The Hoba meteorite in Grootfontein, Namibia, is the largest meteorite known to have landed on Earth. Estimated to weigh around 60 tonnes, it has never been moved from the spot it was discovered in. Hoba is currently a very visited touristic attraction. Image credits Sergio Conti / Wikimedia. A meteorite is any space-borne body that enters a planet’s or moon’s atmosphere, survives the violent trek through it, impacts the surface, and leaves behind solid pieces of material. The name comes from the ancient Greek words “meta” and “aerio”, which put together roughly translate to ‘something hanging up in the air’. Meteorites start their life as meteoroids (small meteors) or asteroids. On contact with an atmosphere, meteorites experience immense friction, causing them to spontaneously combust (at up to 3,000 degrees Fahrenheit, or 1,649 degrees Celsius). 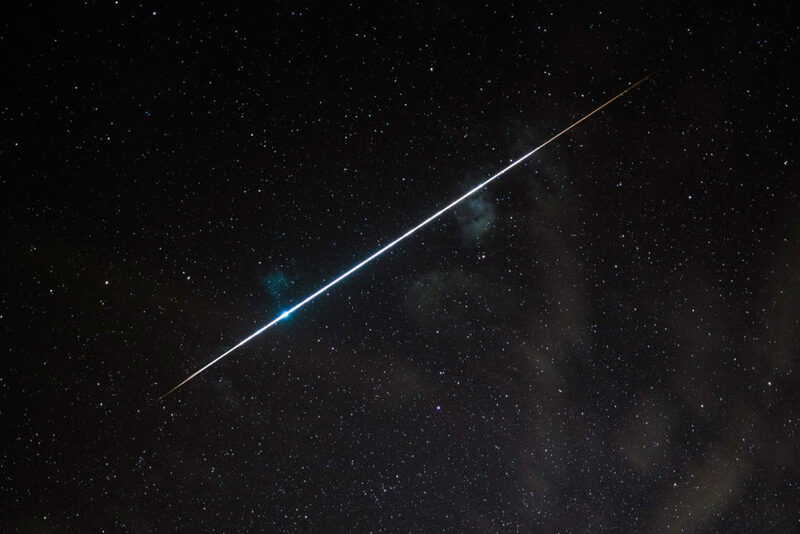 These fireballs — colloquially called shooting or falling stars — are meteors. The life of a meteor is short — and hellish. The friction they experience is enough to raise surface temperatures beyond the material’s boiling point, vaporizing it layer by layer. 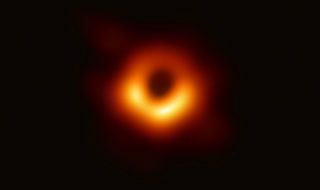 In fact, it’s enough to break apart its (and the atmosphere’s) constituent molecules into ionized particles (basically plasma), which then recombine, releasing energy as light. This is the tail you see on a shooting star. Meteor over Sardinia, seen on the 8th of May 2016. Image credits Migebuff / Wikimedia. The extreme violence of the final impact generally shaves off much of a meteor’s mass — the remaining kernel is our meteorite. Keep in mind that geologists generally call impactors large enough to create a crater ‘bolides’, while astronomers tend to prefer ‘meteorite’. Depending on chemical composition, angle and speed of atmospheric entry, as well as sheer happenstance (whether it breaks apart or not), a meteor needs to range in size between a marble and a basketball for even a tiny portion of it to reach our planet’s surface. Meteorites under 2mm (0.07in) in diameter are called micrometeorites. Meteorites that impact celestial bodies apart from Earth (and thus don’t necessarily pass through an atmospheric layer, such as those hitting the Moon) are called extraterrestrial meteorites. As a side note, these burning chunks also spawned the associated term ‘meteorology’, or ‘the knowledge of things happening up in the air’, the branch of atmospheric sciences involved heavily in the study and forecasting of weather events. 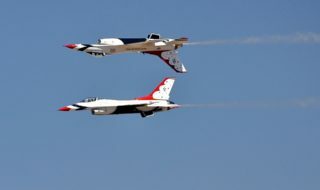 So… what’s the difference between them? As a general guideline, most meteorites are asteroids — but very few asteroids are meteorites. Ceres, for example, is a moon and an asteroid. We do NOT want it to be a meteorite, too! Image credits NASA / JPL-Caltech / UCLA/ MPS / DLR / IDA. The definitions tend to overlap a little. Let’s take size, for example. An astronomer will call any of these space projectiles ranging between a molecule and a chunk several hundred feet wide (usually up to 100m / 330ft in diameter) a meteoroid. Anything larger than that, generally, is considered an asteroid. However, that leaves out chemistry, which is also a hard delineator for what is (and isn’t) an asteroid. Comets are globs of ice and dust formed in the freezing corners of the cosmos (i.e. outside of solar systems). They also have a little pocket of atmosphere around them (a distinctive feature for comets), generated by evaporation from this ice. Their interaction with heat and particles generated by stars is what creates those long, elegant plumes that are quintessentially comet-y. Comets can and do fly towards planets and moons. The beefier ones also generally make it through any atmospheric layer and impact the surface. 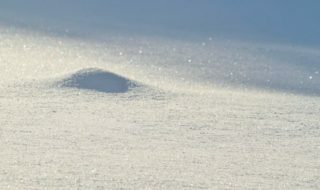 What makes comets generally fall short of being termed ‘meteorites’ is that they’re made up of volatile materials that don’t survive post-impact. However, some do — and also leave behind traces of their impact in the form of impact glass or diamonds. While definitely traces of impact, it can be seen as a technicality to consider such elements remnants of the impacting body itself. I personally do. So, following the impact-and-debris definition, I’d consider comets impacting the surface to be meteors as well. And herein lies the difference. To be a meteorite, one needs to impact a planet or moon and leave behind solid debris. To paraphrase Iain Banks (my favorite author) the meteorite only lives as it is falling. For asteroids, it’s sufficient to be. Have the right chemical make-up, don’t be too tiny, don’t sublime too much when around stars, and voila! You’re an asteroid. Most asteroids are nice and never impact any planets or moons. The overwhelming majority of them, actually, are content to orbit around in their asteroid belts or on whatever path they’re set on. But we should never take their absence for granted; it only takes one to come visiting for humanity to become a thing of the past.